Wheelchair rugby’s roots go back to wheelchair basketball and ice hockey. It was created in 1976 by Jerry Terwin, Duncan Campbell, Randy Dueck, Paul LeJeune and Chris Sargent, five Canadian wheelchair athletes in Winnipeg, Manitoba to be a sport for persons with quadriplegia. 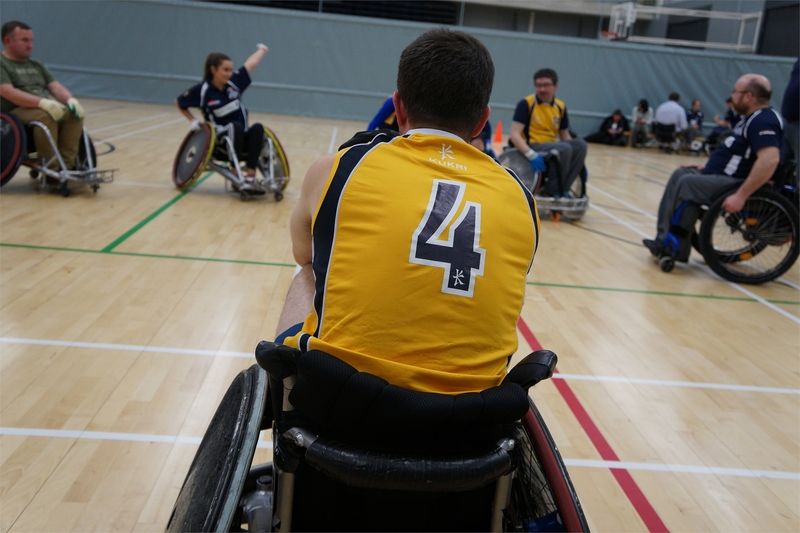 At that time, wheelchair basketball was the most common team sport for wheelchair users. That sport’s physical requirement for players to dribble and shoot baskets relegated quadriplegic athletes, with functional impairments to both their upper and lower limbs, to supporting roles. The new sport — originally called murderball due to its aggressive, full-contact nature — was designed to allow quadriplegic athletes with a wide range of functional ability levels to play integral offensive and defensive roles. Murderball was introduced to the United States in 1981 by Brad Mikkelsen. With the aid of the University of North Dakota’s Disabled Student Services, he formed the first American team, the Wallbangers. The first North American competition was held in 1982. In the late 1980s, the name of the sport outside the United States was officially changed from Murderball to Wheelchair Rugby. In the United States, the sport’s name was changed to Quad Rugby. The first international tournament was held in 1989 in Toronto, Canada, with teams from Canada, the United States and Great Britain. In 1990, Wheelchair Rugby first appeared at the World Wheelchair Games as an exhibition event, and in 1993 the sport was recognized as an official international sport for athletes with a disability by the International Stoke Mandeville Wheelchair Sports Federation (ISMWSF). In the same year, the International Wheelchair Rugby Federation (IWRF) was established as a sports section of ISMWSF to govern the sport. The first IWRF World Wheelchair Rugby Championships were held in Nottwil, Switzerland, in 1995. Wheelchair rugby appeared as a demonstration sport at the 1996 Summer Paralympics in Atlanta, and was granted full medal status at the 2000 Summer Paralympics in Sydney, Australia. There are currently twenty-five active countries in international competition, with several others developing the sport. The President of the IWRF is John Bishop.